You can easily grasp this classic ferrite board magnet thanks to its plastic cap and it is available in different colours. 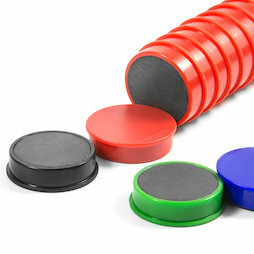 These flat round magnets attach individual sheets and maps, notes, drawings, etc. in no time at the right spot. Ferrite magnets are cheaper than neodymium magnets of the same size, but their holding power is weaker. Hence, for the use on whiteboards and walls that are painted with magnetic paint, we recommend our significantly stronger neodymium office magnets Boston Xtra.